The season of darker days and rainy weather – otherwise known as fall and winter in the Pacific Northwest – is also a peak time of year for vehicle crashes. For more than 20 years I have been helping people injured in motor vehicle collisions. Simply stated, the clinical goal is to help improve quality of life by helping patients get on the road to recovery and helping injuries stabilize and heal. Sometimes people come in for care months or years after a collision, and we can still help, but it usually becomes more complicated. Naturally the best strategy is to avoid a collision in the first place. Driving during wet weather brings additional challenges, such as slowing down can take longer because of your vehicle’s tendency to hydroplane as the tires rise up on a film of water. This is also true for cars and trucks behind you, and who can collide into you. This is why we all need to allow ample stopping distance between our cars while driving. Also when we’re at a stop for a red light or stop-sign, we need to leave enough space between us and the vehicle in front so that if we do get hit from behind, we don’t also collide into the car stopped in front of us. We should also make a point of slowing down early when approaching an intersection or making a turn. – Safety comes first, so get off the road if possible. I recommend that you call 911, even for minor crashes. I’ve seen several instances where not calling the police turned out to be a big mistake, but never heard of a situation where calling the police was a problem. – If you or any passengers are hurt and you suspect medical attention is needed, don’t hesitate to ask for emergency medical assistance. Follow the advice of first responders if they recommend that you go to the emergency room. – Only speak to the police and/or the other driver(s) to gather information. If you are approached by a witness, it’s good to get their contact info also. Collect the following information at the crash scene: Name, phone number, address, email address, license plate number, driver’s license number, insurance carrier and policy number, and the model, make and year of the car (s) involved. – As long as the area is safe from other traffic, it’s a very good idea to take photos. Get photos of things like: Street signs and the accident location, the damaged areas of the cars involved, license plates of the other cars, and maybe the people involved. – Don’t self-assess or self-diagnose your injuries. Instead let an expert like a chiropractor examine you. Even small accidents can cause injury to your neck and spine. – In many instances, it’s a good idea to report and possibly file a claim with your insurance company. It can also be a good idea to contact an attorney to discuss legal issues. Like many of my chiropractic colleagues, our education, training and experience tend to make us experts with the injuries and conditions related to motor vehicle crashes. Our expertise centers around such things as identifying the mechanism of injury, identifying what parts of the body are injured, identifying any pre-existing conditions that may have been worsened or become aggravated. We also look closely at things like body position at moment of collision, relative mass ratios of the vehicles involved, collision angles, speeds and vectors. These are usually complicated and complex issues that are important when it comes to understanding how to help patients heal from injuries. 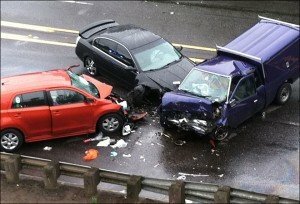 In addition to treating patients with these injuries and conditions, I have also been an expert witness in arbitrations and in court cases where these technical elements of car crashes have become very important factors. Sometimes, people feel fine following an accident and their vehicles may look undamaged. But it’s always a better idea to let experts help you navigate thru the issues instead of making amateur decisions about your health. In some cases we see something called “Delayed Onset” where it can take days or even several weeks before the effects of injury become apparent. The amount of pain you might have right after a car crash is relevant, but it’s not always a sensitive or accurate measure of injury. My advice for you is to drive safe, teach your children to drive safe, allow plenty of room between cars, and if you’re in a collision, give a call and we’ll help you get back to a normal life. If you have been in a car crash, call our office at 425-778-9600 for a consultation.